Looks perfect! making me hungeeee! perfect tea time snack..so how have you been? wondered why your posts wern't showing up on my reading pane. You have come back with the all time hits...these look so crisp and perfectly shaped. Yumm!! !onion samosas makes me hungry! Looks super crisp and yummy! 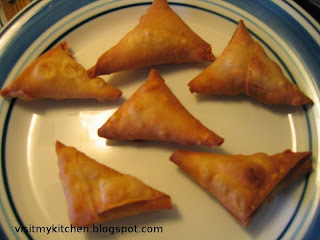 Samosas are lovely and look crispy and crunchy. Really yummy samosas sowmya! I'm following you!Do check my blog..!